A step-by-step guide to airbrushing flames. In this instructional DVD you'll shown the insiders tips and techniques to airbrushing on metal. Whether you are a beginner or advanced airbrusher, you will discover the secrets to of auto airbrushing. The equipment you need and how to use it! Correct uses of tape and masking -- explained in detail! How to paint flames step-by-step! GUARANTEE: If you honestly believe 'Introduction to Airbrushing Flames' is not everything that we say it is and you are not completely satisfied with it, return it within 30 days and we will refund every penny of your money with no questions asked. Save $9.90! 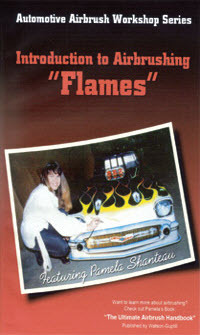 Order an Introduction To Airbrushing Flames, Motorcycle Gas Tank Airbrushing, and Automotive Mural and Masking Techniques DVD's, and you'll get $9.90 off!